Brooks Koepka has described hearing that a spectator struck in the eye by one of his tee shots during the Ryder Cup could suffer long-term consequences as "probably one of the worst days of my life". Koepka said in a statement on Twitter on Tuesday that he was "deeply hurt and saddened" by the incident and also addressed what happened in a press conference on Wednesday ahead of the Alfred Dunhill Links Championship. "Yesterday was probably one of the worst days of my life," Koepka said. "I haven't had too many tragedies in my personal family where there's been a loss or any kind of tragic accident so I've been lucky in that sense. "I wasn't told until I got to the course - I'm not the biggest person on social media - so when I got here and had about seven missed calls and 25 text messages I was like, 'What's going on? Then I was told the news and obviously I am really heartbroken. "My stomach sank. Yesterday was probably one of the hardest days trying to focus and play golf just knowing what was going to come when I was done. "I spent an hour-and-a-half of my round on the phone trying to understand what was going on because it's hard to get the real story of what was going on. I didn't know if it was fake or not and you want to find out. It's sad and I really am torn up about it." 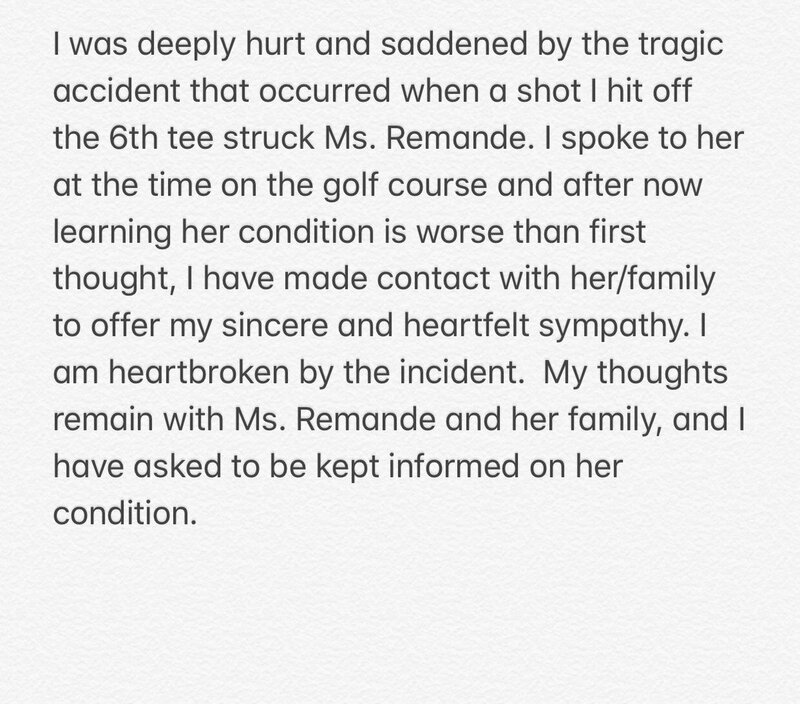 In Koepka's earlier statement on Twitter, the reigning US Open and US PGA champion said he was "heartbroken" and had been in contact with Remande's family to offer his "heartfelt sympathy." The European Tour has said it will offer "support for as long as necessary" to her.